MustMail is a mass communications application developed by Cal Poly Corporation for use by Cal Poly communicators. The application was designed to utilize existing Cal Poly resources and services to provide a simple mechanism for sending and managing small and large scale email communications, while being flexible to allow for growth and expansion over time. The MustMail application allows communicators to send impactful customized HTML emails to university or department created email groups, collect analytical data when applicable, and provide auditing of outbound communications. To get started using MustMail, submit the Application Form. 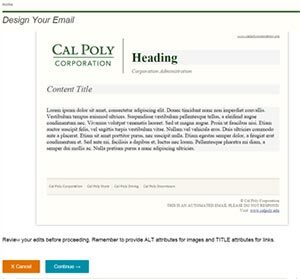 If you would like to use an existing HTML email template or create your own template you must submit it to it-policy@calpoly.edu for review in accordance with standard Cal Poly Mass Mail guidelines on accessibility. Access to the MustMail application is restricted to defined campus groups/departments. Please contact your group or department administrator to request access or inclusion in alternate groups. Which email groups can I send to? Can I add groups to my MustMail list if I already have access to them? How do I create a new Sympa group? Will I need tech support to use MustMail? Can MustMail tell me how my email performed? I'm a data geek, how do I knaow who went from my email to my website? MustMail allows you to email campus and/or department created groups. As part of your account setup you will submit a list of email address that you can "send as" (ex. MYDEPARTMENT@CALPOLY.EDU) and your list of Sympa groups that you can "send to." Both your from and to lists must be authorized by Information Technology Services. Cal Poly provides a list of auto-generated email groups that are available for mass communications (ex: all faculty, all students, etc. ), these lists are updated nightly via the campus data warehouse. Departments can request to use these groups (See Mass Mail Guidelines) or they can create their own groups within Sympa. Yes, you can add additional emails to your list. To request additions or changes to your approved email list contact the MustMail administrator at mustmail-admin@calpoly.edu. If you are adding additional restricted lists a new application form must be submitted to it-policy@calpoly.edu. Sympa is the Cal Poly open source, web-based email list management application that provides both user and administrator interfaces. 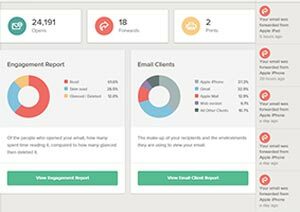 Sympa allows you to create and manage email lists, subscribe or unsubscribe from email lists, or serve as a email list moderator. Departments on-campus can use Sympa to create custom groups from existing data or use existing auto generated groups. The MustMail application uses HTML formatted email templates. These templates can be given editable sections to ensure limits to modification of the template. Any section of the email can be made editable as required and your account can contain multiple templates for your department. Please note that the only elements that may be marked as editable are <h1-6>, <div>, and <p>. See the code below for an example of how to create an editable region called 'block1'. A simple syntax is used to creating editable sections for your template. Using MustMail is easy and you should not require IT support once your account is configured and your HTML templates are developed. However, setting up your account will require some technical support. MustMail uses the existing campus network security for account management and will require your department network administrator to assign permissions. What are the steps to send an email? I'm a data geek, how do I know who went from my email to my website? MustMail templates support the Google Urchin Tracking Module (UTM) which can connect with any site running Google Analytics. 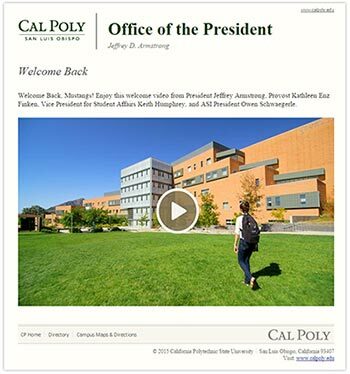 For more information on how to use UTM please email the application administrator at mustmail-admin@calpoly.edu.